Thinking of Selling My Qmx Mal Pistol. Price? Discussion in 'Replica Props' started by Schmusey, Oct 19, 2011. I saw one go on eBay for a little over fifty bucks a while back. Also saw one bring about the original retail price of $160. if the offers are too low; keep it. There have been a whole bunch of one-offs or just-a-couple-made versions. Someone released a handful of resin kits cast in Sidero's metal Mal molds. Someone on eBay has been selling a resin Mal that looks like it is recast from a partially assembled Sidkit. but I have never seen one come up for sale. :lol Wow I hadn't realized that there were so many more sophisticated builds out there. I would love to get my hands on a metal one. I'm guessing these Sidkits were a limited run years ago? Either way I think I'll keep mine if all I would be able to get is my original price. I am far too attached to it. Thanks for the info! $50. ? Why do I always miss the cheap stuff. I look, and look, and look. I even have that as one of my saved searches on ebay. and I missed it again. I'm always hearing about folks getting them that cheep. (I always heard of folks getting MR sabers and blaster really cheep too.) I've got some deals in my day, but never like that. 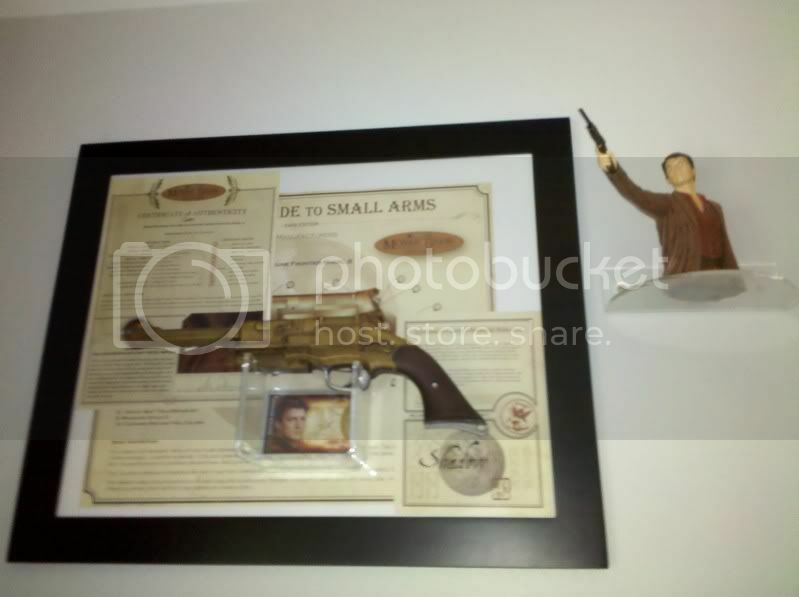 I have wanted that version of Mal's pistol for years, but really want to get it on the cheep. The list above is true for some, but not for all. There are actually even more versions out there, but most are not worth mentioning. The thing is, other then a few underground castings, and the short run Sidkit did before he died, the QMx version is the only serenity Mal pistol on that list. Sidkit's other ones, and Phil's, Wilco's, the 47A, and the rest are all the show version. Witch to a fan like me, makes a difference. I love the show version, and have 2 (A sidkit, and one of Phil's castings) But I would still love to have one of the licensed QMx serenity pistols. Sidkit actually did a number of Serenity version Mal pistols and only offered them to previous TV version buyers I believe. Well, I said, aside from Sidkit, and some underground folks, QMx was the only ones to do a serenity version. So I did kind of say that Sidkit did do some. I'm new and don't know the etiquette, so if this isn't the right way to reply I apologize. I just made a post in the new member WTB thread concerning this type of item.